Many terminators choose Uganda as a destination for terminating VoIP traffic. With an average rate of $0.1, there are quite low rates for local communication. The international cellular company Africell takes the fourth place in the market in terms of the number of subscribers (about 1.8 million). If you buy SIM-cards of this operator, you can make good money if you choose the optimal tariff plan. 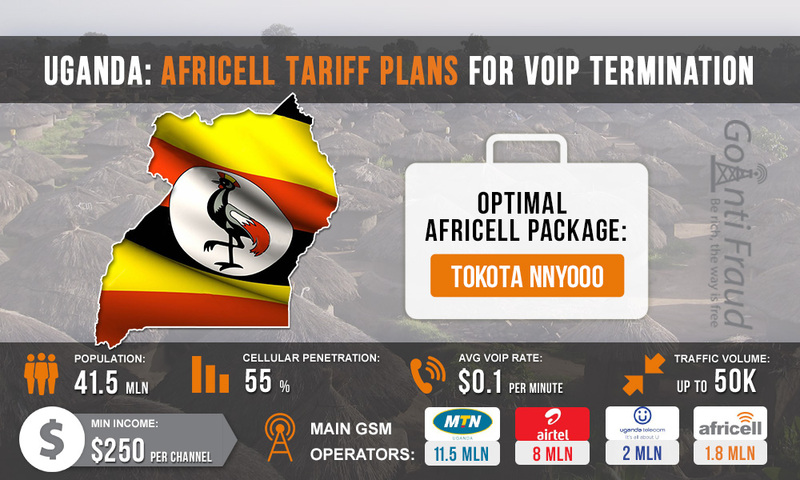 Africell Uganda provides quite profitable call tariffs for prepaid customers. One minute of an on-net call a call to the numbers of other operators will cost $0.06. The cost of one Africell SIM-card is as little as 42 cents, and the new subscriber has 10 free minutes to make on-net calls. Tokota Nnyooo. The package contains several proposals that provide 20, 30, 200 and 750 bonus minutes. For GSM termination, an unlimited packet is the best option. Paying $0.28, the subscriber gets the opportunity to make free on-net calls 24 hours a day. Super Combo. Subscription per day is 28 cents, the operator provides 20 bonus minutes. Subscription in a week is 4.2 dollars, with 300 free minutes. You can pay 14 dollars a month for the service and get 1,000 bonus minutes for calls. O'fwono Tooti. For $ 0.14 the subscriber gets 30 minutes for on-net calls. The most profitable tariff plan is the unlimited Tokota Nnyooo. Using it, you can earn at least $500 dollars via one channel. By setting the goip voip gateway that has several ports, the terminator can increase the revenue terminating traffic.